Bring the Breast Meat! Dimension Films Release New Red-Band Trailer for 'PIRANHA 3DD'! Dimension Films have released a new Red Band trailer for John Gulager’s Piranha 3DD [via IGN]. Piranha 3DD hits theaters this June 1st. The movie stars Danielle Panabaker, Matt Bush, Chris Zylka, David Koechner, Meagan Tandy, Paul James Jordan, Jean-Luc Bilodeau, Hector Jimenez, Adrian Martinez, Clu Gulager, Gary Busey, Katrina Bowden, Christopher Lloyd, Ving Rhames, Paul Scheer & David Hasselhoff. 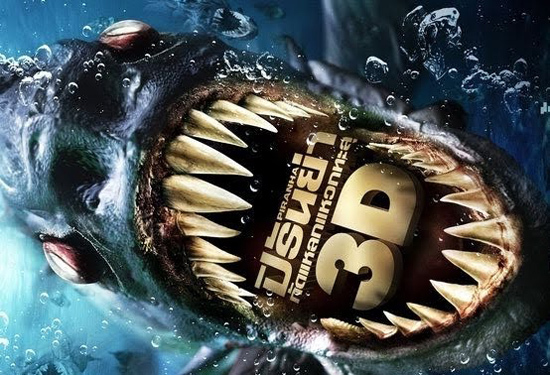 Saw 3D writers Marcus Dunstan & Patrick Melton penned Piranha 3DD. Hit the jump for the details. Synopsis: "Having awoken from their spring break extravaganza at Lake Victoria, the swarm heads upstream where they look to make a meal out of Big Wet, a local water park where when it comes to fun, nobody does it wetter! Thought they came to get wet, get loaded and get some, the staff and patrons get more than they bargained for when they must face the fiercest, most bloodthirsty piranhas yet. Lead by the strong-willed, studious Maddy and her friends, Barry and Kyle, the trio must dive in and take on these man-eating creatures using every ounce of their being…but can they be stopped?" I'm reading: Bring the Breast Meat! Dimension Films Release New Red-Band Trailer for 'PIRANHA 3DD'!Tweet this!